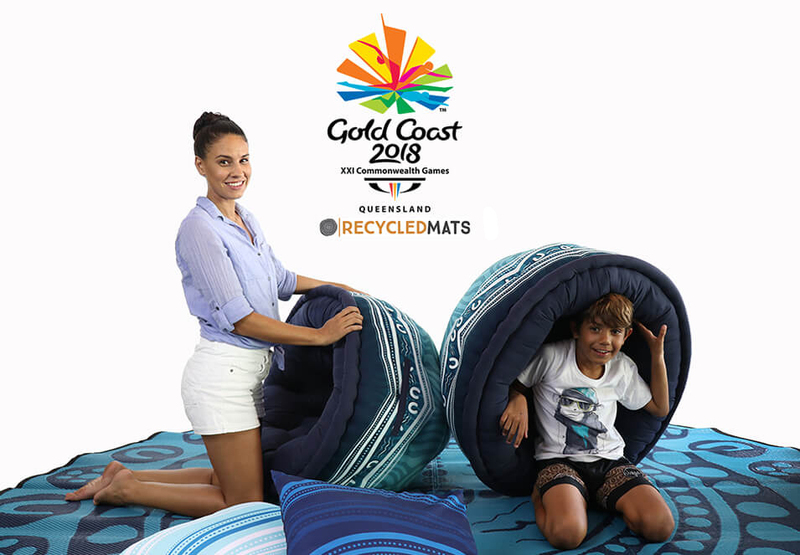 Behold the Recycled Mats & Commonwealth Games 2018 Art Collaboration! We can finally let the cat out of the bag! 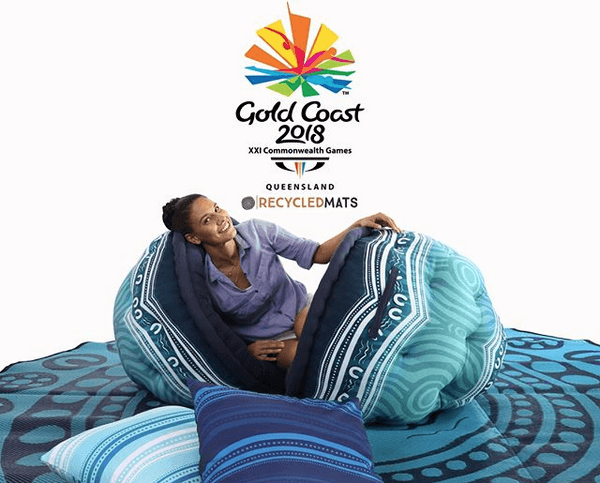 In 2017, we were approached by the organisers of the Commonwealth Games Festivals & Ceremonies 2018, officially known as the XXI Commonwealth Games, about a possible Commonwealth Games 2018 art collaboration with Recycled Mats, and to be their preferred supplier. The Gold Coast 2018 Games, held on the Gold Coast of Australia from the 4th to the 15th of April was planned to be the most inclusive multi-sport athletic event the world had ever seen, and they had a clear missive to ensure Indigenous culture was well represented. Our task was to provide a specially commissioned piece of Indigenous art to be printed on recycled mats, cushions and pod chairs to create a brand space. 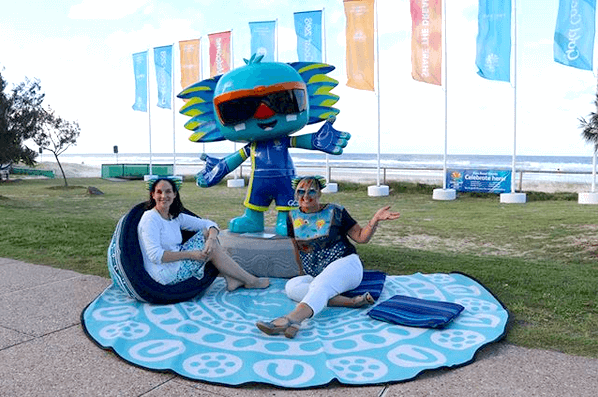 These artistic home wares were to be placed around the Games precinct and at Festival 2018 sites to create comfortable seating and relaxation zones for spectators, visitors, athletes, and their families. In seconds, we were on the phone to one of our favourite artists, local Fingal woman Christine Slabb, Bundjalung / Yugamben Nations. We challenged her to create a design that would be eye-catching, popular and reflect the stories of her people in the Gold Coast and Tweed regions. Christine created a design she named Garrima or ‘Respect’. Joongarrabah, meaning the place of the pelican, is a peak that overlooks the Tweed and Gold Coast Region. This iconic landmark is a vital part of the local cultural landscape. For many generations, this special place has been significant in the teaching of “Garrima” respect. The design, an eye-catching combination of Indigenous symbolism to signify family, and community, was manufactured in both a striking navy blue and teal combo, or a teal and white combination. 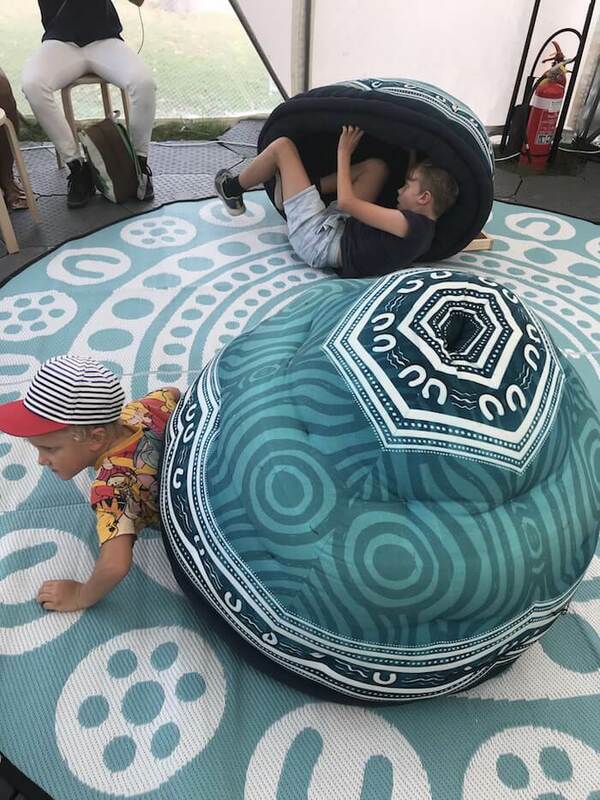 The elegant mat was a huge talking point amongst families and visitors who gathered around the yarning sand circle in the middle of Kurrawa Park at Festival 2018. 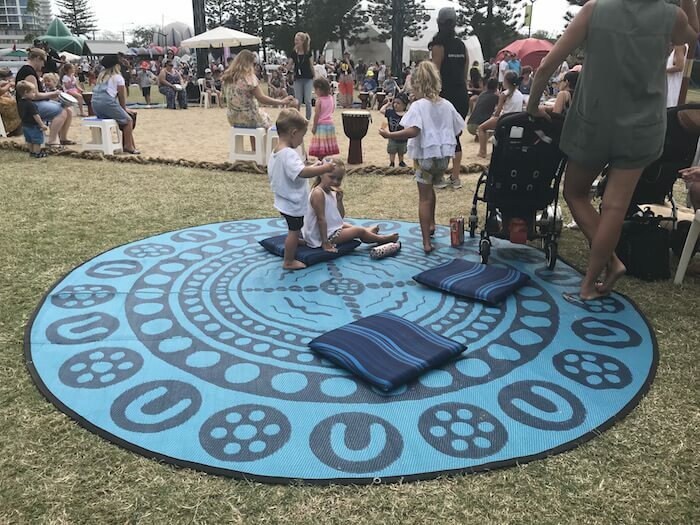 A selection of blue-hued Garrima mats, along with Garrima cushions, encircled the ring of sand for children and families to sit on while they watched the free entertainment. What a tremendous sight! Next to the Sand Circle, was a giant dome dedicated to the children visiting Festival 2018, called the Jarjums Children’s Learning space. 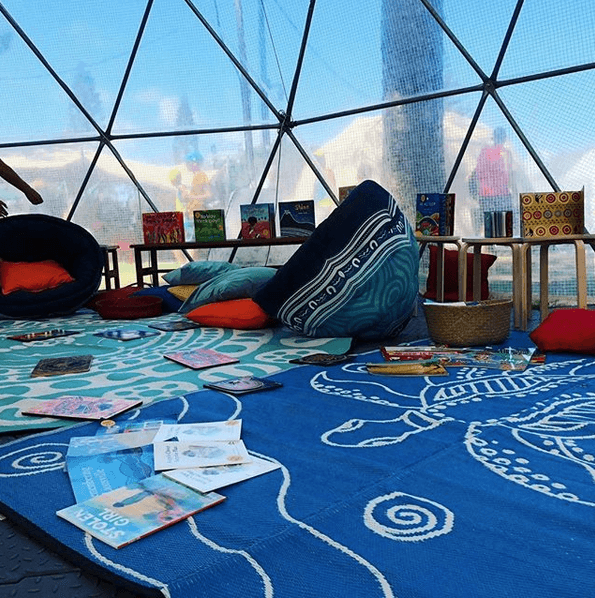 Styled in beautiful teals and blues, the dome was filled with learning activities for children aged 1-10, and our Garrima products – mats, cushions and pods - were centre stage. The egg-shaped Limited Edition Garrima design Pod chairs in teal and aqua were quite a hit. Children and adults alike were drawn to these incredibly comfortable chairs, to chill out, to laze about and to play. Funnily, children playing ‘turtles’ hiding underneath a pod chair was a common sight! 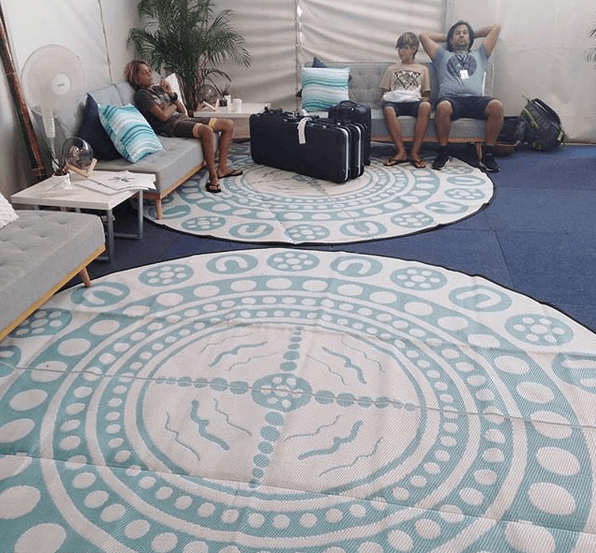 The mats and pods were also in place in the VIP green room for use by the featured artists, performers, and Indigenous elders at the Commonwealth Games events. The 2018 Gold Coast games organisers also ordered multiples of our other popular recycled plastic picnic mats in Indigenous designs such as Gatherings, Yarning Circle and Tracks, all designed by De Greer-Yindimincarlie, and Turtle Journey by Helen Price. These mats were used in the magnificent artspace dome under craft tables, in the puzzle areas, and in the kid’s activities zones. We cannot tell you how proud we are to have been involved with this spectacular event. It’s been one of our biggest highlights of the Recycled Mats journey so far, a life-changing opportunity to share the voice and stories of our local Indigenous people with the greater world. We’d love to thank the organisers of the XXI Commonwealth Games, and Festival 2018, for this unique and fruitful opportunity.